Work: PM1 hose in lieu of grooming/PM2 groom. Report: An “easy” day after the “challenge” of yesterday. Ridiculous, I agree, but the student gets to set the terms of what is easy and what is hard. Ramblings for the Day: This weekend, we cut the grass near pasture gate and along the outside of the fence. I was sorry to see it go. It was lush and green and yummy looking. Unfortunately, it had grown long enough for giraffe neck to reach over and graze. I wish I trusted horses in general or this horse in specific enough to hand-graze him outside of the field. We used to let Mathilda and Previous Horse loose on the spring grass in a temporary, electric pen around the front yard. Right up until Previous Horse tuned into Cow Radio, revved up, and trotted right through the lit wire. 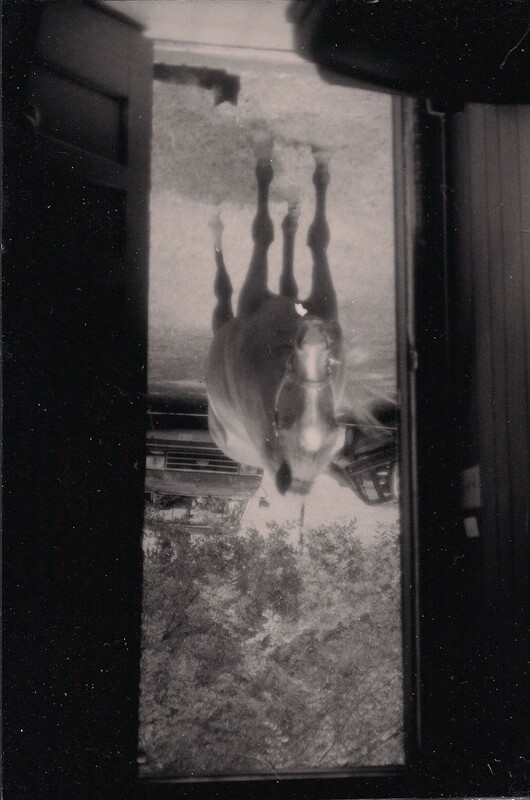 The picture does not properly convey the unmitigated weirdness of having one’s horse looking in one’s front door. Rodney is perfectly well-behaved on a lead, most of the time. However, a) I don’t trust him not to have a come-apart; b) I don’t trust myself to hold him if he does; and c) I don’t want him to be outside the field if a leads to b. I do realize this phobia limits our ability to leave the property for lessons & shows (Pretty Head). Maybe he can have the grass next spring. What phobias are keeping you from going where you want to go? Currently, a phobia of getting even more behind on my vet bills is keeping me from a) getting the trailer re-certified to b) ship to a nearby clinic to get Young Master Parker’s ankle ultrasounded and shockwaved. So many, but I’ll say being in dark, enclosed spaces keeps me from attending some events and from getting on elevators and subways and scuba diving.